In 2011, Apple decided the resolution limit of the human eye when holding a phone was about 300 pixels-per-inch. Well, screw that. However, in Mr. Jobs defense, he didn’t exactly see the future where we’d be putting our smartphones only a couple inches from our face, thanks to smartphone-powered VR headsets like Gear VR, Google Cardboard, or even the new VR headset for LG’s G3. 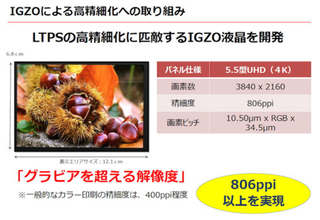 The 3860X2160 IGZO panel still has a few remaining questions to answer. First, Sharp needs to figure out mass production, meaning we won’t be seeing this display anytime soon (more like 2016), and second, how these displays won’t absolutely demolish our already frustratingly poor battery life.